This month Bolivia passed the world's first ruling that grants all nature equal rights to humans. The “Law of Mother Earth,” agreed by politicians and grassroots social groups, redefines the South American nation's mineral deposits as "blessings" and is supposed to lead to radical new conservation and social measures to reduce pollution and control industry. One of the sectors to be largely affected is mining, which not only is Bolivia’s second biggest industry, but it injects $500 million a year into the economy. This represents nearly one third of the country's foreign currency. The new law —passed on Oct. 15—protects the right of nature "to not be affected by mega-infrastructure and development projects that affect the balance of ecosystems and the local inhabitant communities". So what will all these mean for mining companies operating or with projects in the Andean nation? According to Matatea Changuy and Sophie Beier, from Pulsamérica.co.uk, the first obvious implication is that Evo Morales’ government is now legally bound to prioritize the wellbeing of its citizens and the environment. Thus, measures compromising mining activities in the country may be take in any moment alleging compliance with the new regulations outlined in the Mother Earth’s law. In other words, such a complex and novel legal persona needs more than its inscription into the law: it needs a plan, a concept of how to reform the law from an ecological perspective. And how to do so, without creating more conflict. Bolivia, often ridiculed by the USA and Britain in the United Nations climate talks for demanding steep carbon emission cuts, has established 11 new rights for nature. They include: the right to life and to exist; the right to continue vital cycles and processes free from human alteration; the right to pure water and clean air; the right to balance; the right not to be polluted; and the right to not have cellular structure modified or genetically altered. It draws on the Andean philosophy that views the Pachamama (meaning Mother Earth in native language) as a living being and sacred home. Evo Morales, South America's first indigenous President, has become an outspoken critic in the UN of industrialized countries. He has also become notorious for raising mining taxes and nationalizing the country’s key natural gas industry as well as the telecommunications and electricity sectors, since taking power in 2006. Earlier this year, Bolivia took over assets from Spain’s Red Eléctrica Corp. (REE) and Pan American Energy LLC. And in July, Morales seized and nationalized the assets of Vancouver-based South American Silver Corp. (TSX:SAC), accusing the miner of causing a conflict that saw violence erupt among communities around the silver-indium-gallium project it was developing there. 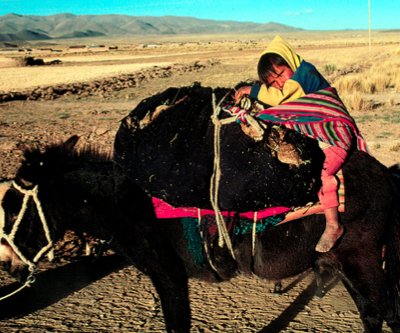 Image: Bolivian child rests on a donkey after long journey. Courtesy of Peace Corps.